I had initial reservations upon receiving this album, the name of the artist (taken I presume from the sub label for CMI) and the title of the release being a little too generic for my liking. It was going to be of no surprise what would come out of the speakers, although I do love power electronics so there was that to smile about at least. For the most part this is approached in a manner I expected. With a steady barrage of blistering electronic distortion, tempered with psychedelic overtones and screeching high end blisters of noise there is a lot for the purists to relish, even if this does pander to the mainstream (in the PE sense of the word). 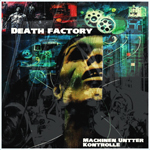 There are some moments on DF’s latest release that stand out; namely, ‘Manifestation of Fear’. With its steady Industrial pace, carefully cultured into a mass of writhing wires of noise over a pounding rhythm section, it eventually bubbles into a pot of visceral rage and I would like this project to position it’s sights firmly on this target in future. As generic as this is, there is a lot here that any long-term follower of the scene should enjoy. I do think in this day and age though, that steps should be made to outclass what has come before and start introducing something new to spice things up a little to stop the rot. The movement has hit a stalemate, and if it’s not careful it will fall in on itself, as some of the larger labels out there appear to have foundations that are crumbling away; unfortunately DF are not the one to change this pattern, no matter how enjoyable some of this is. Things start off in fine form with low-end Dark Ambient and cold sub textures. Range has been carefully managed along with pace, giving space for each individual element to be capitalised on at an audible level. The tracks are untitled and this for me makes a lot of sense, as one song flows into the next seamlessly. Drones are woven amongst other fractures of sound like a thread and whilst there isn’t much to differentiate from one piece to the next and with eight tracks spanning just over 35 minutes, this isn’t too overbearing either and easily consumed all as one act. Okay, there isn’t much on here that I haven’t heard before if truth-be-told. The thing is, I do adore my DA on a massive scale and for me albums of this ilk are either good or they’re not and there is no middle ground. 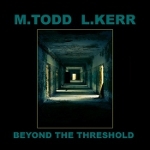 ‘Beyond The Threshold’, stands its ground in the former as a good Dark Ambient album; nothing amazing to launch it to the top end of the scale where the likes of Inade and Megaptera dwell, but standing on the lower rungs of that ladder with enough interest for the avid fan to consume.